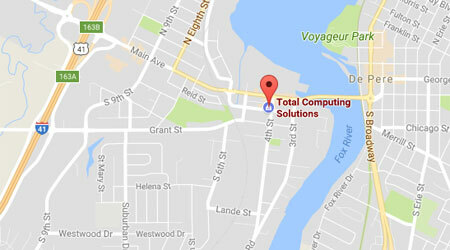 Total Computing Solutions was founded by Adam DeNoble, an inventor, engineer, and childhood technology guru. Mr. DeNoble started the company as his first entrepreneurial venture at the age of 15 as a hobby business helping people with their personal computer problems. Adam continued to operate his company throughout high school and college, during which time he expanded his expertise by also working with an Internet service provider, and then later as an engineer, focusing on research and development. Adam’s success as an engineer is evidenced by his recognition as an inventor on a number of U.S. and international patents concerning the development of sophisticated sensing and control devices for high-speed manufacturing equipment, with an emphasis on computer vision technology. In 2009, Adam took Total Computing Solutions to the next level, adding additional staff and resources, in order to establish the current downtown West De Pere office. Adam embraces the concept of technology minimalism; the idea of using technology to enhance people’s lives, but not overusing it to the point of excessive dependence. With this concept, and a strong set of values including trust, honesty, ethics, and quality, the company has grown substantially each year and has built a strong reputation for excellence in the community. Our technical staff consists of information technology professionals with many years of both technical and customer service experience, who are certified by the Computing Technology Industry Association (CompTIA) and operate under the direction of a highly qualified computer scientist. We are also a corporate member of CompTIA and our facility is certified by CompTIA as an Authorized Service Center for computer, network and server support. We strive to uphold the principles of the Code of Ethics and Professional Conduct of the Association for Computing Machinery (ACM). Our executive management holds senior level membership in the ACM as well as professional level membership in the Institute for Electrical and Electronics Engineers (IEEE). Our company focus has continued to shift over the years with the demand of our clients. Originally focusing on providing service to individuals and a handful of very small businesses, we now work primarily as an outsourced IT department for small businesses. Once focusing exclusively on the break-fix model, in recent years we have been increasing the number of proactive service plans that we provide, making us a more comprehensive service provider. We hold true to our humble origins and always aim to make every client feel important and valued, regardless of their size or level of interest in any of our particular service offerings. We hold true to our technology minimalism philosophy in that we will always recommend a tried and proven solution that we can completely control over the latest cloud-based service offerings. In a world where it often seems like nobody cares about privacy or security, we fill a critical role by addressing those concerns on behalf of and in concert with our clients. In addition to our proactive and break-fix services, we also specialize in assisting large IT service providers by serving as their local team when one of the larger service provider’s clients in our local area experiences an issue that cannot be resolved remotely. Loyalty: By choosing us, you can enjoy the benefit of having a trusted local partner that helps you make the best IT decisions based upon your needs and preferences. Unlike the big box managed service providers, we always keep your best interests in mind. We won’t sell you something unless it’s the right tool for the job, even if it means we miss out on a sale. Wide Range of Services: Whether it’s our long-term service plans or a one-time fix, we provide you with a full range of services to answer most, if not all, of your IT concerns. We offer in-store, on-site and remote service so you’re not left hanging by a “remote service only” company when you need them the most. Representation: We act as your representative at the bargaining table when dealing with other IT service providers and vendors. We work hard to get you the best deal possible for your company, giving you added peace of mind. Oversight: We help you maintain control over all of your IT related services and provide oversight of your other IT service vendors, ensuring you’re not being exposed to unacceptable security risks or being taken advantage of. Reliability: We give you the confidence in knowing that whenever you have any sort of IT related problem, all you need to do is call us and we’ll take care of it properly and quickly. We believe that by consistently providing the highest quality of service, clients will choose to continue to use our services. Technology Advising: We help you get the most out of your IT investment as well as offer advice on what technology to invest in. This can occur formally in sit-down meetings or informally in the course of discussing infrastructure upgrades or other services. Transparent Billing: We have always been opposed to the idea of the long term support contracts that the big-box MSP’s are so well known for. All of our clients are free to leave us at any time and they only pay for the specific work that they request be done. We account for every cent that we bill for with detailed documentation on every invoice. Total Computing Solutions can help your company use technology to reach new heights. Get started today with Total Computing Solutions by contacting us at (920) 569-2681 or service@tcsdepere.com to speak with a member of our team.